So inspirational! 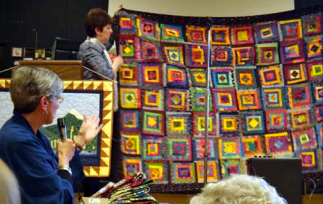 Pippa Moore dazzled our membership with her inspirational quilting journey at our April meeting and we all appreciated her discounted sales as she retires from the public quilting life. Close looks at her quilts revealed the artistry. And of course the vivid colours, and unique fabrics. We will all miss Pippa’s classes, her talks, and her insights. I met with a consultant from Long & McQuade at the Church to review options to upgrade our microphone system. We have been looking at more powerful systems, so that those at the rear can hear. And of course, we are looking at wireless mikes. We are close to making a decision, and will likely have a new system if not by May, then by June. The new system should improve your Guild experience. 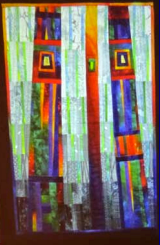 This is the season for quilt shows and art exhibits. Grab a friend, and explore! I was lucky enough to attend the Sunshine Coast Quilt show in Sechelt where the guild displayed many winning quilts from 25 years of prior shows. There were many striking examples of our craft at the Boundary Bay show. We certainly are a vibrant community.